Mike Johnson’s custom table might be the only Goonies-themed machine in the world. 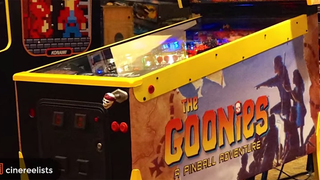 While the theme of the timeless classic The Goonies seems perfect for a pinball machine (it has skeletons, pirates, treasure, and adventure, and it’s from an era when pinball was very popular), no company ever made one. So this one’s just perfect for the movie’s 30th anniversary. And it’s a really smart build, and the design follows the story: the upper playfield, for example, is the cave with the pirate ship, and unlocking multi-ball represents the kids’ rescue.